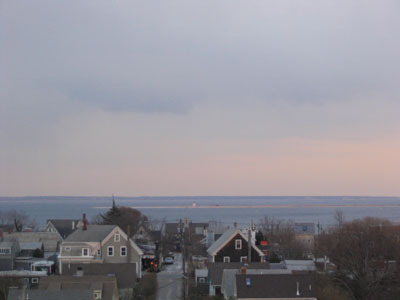 in the West End of Provincetown. 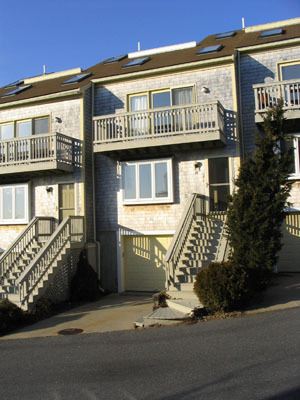 In the West End of Provincetown, enjoy a fabulous modern condo in a small, quiet development! Only a few minutes walk to Commercial Street's great shops, galleries, and restaurants. Or to the beach. This waterview unit has a living room, dining room with seating for 8; three bedrooms with newer queen sized beds, three bathrooms, and outdoor space. Three skylights, a loft, and four decks (including a roof deck) make for a bright and cheerful vacation. (except $3000/week for July 4th and Family weeks; $3500 for Bear week and $3600 for Carnvial week). (last week of June and first two weeks of September). $2100/week for the Spring and Fall seasons. Note: 2nd-car-parking is available for an extra charge. Summer weekly rentals are all Saturday 3PM to the following Saturday at 10AM. For more details of the 2016 season, please contact us. WE ARE NOW TAKING RESERVATIONS FOR THE 2016 SEASON! MINIMUM RENTAL PERIOD: ONE WEEK! Note: We have in place a secure and proven structure for payments that includes using the US Post Office for leases and deposits via bank check. This gives both the tenant and landlord trackable and verifiable assurance. We can be as flexible as we can with many aspects of the rental, but we will require a signed lease to be mailed back and forth to secure the rental. Well-stocked kitchen: cooking utensils, coffee maker, toaster, blender, 'fridge with icemaker, microwave, stove, chopper/mixer, dishwasher. Central Air Conditioning. Outdoor gas grill. Linens provided (all cotton). Plenty of storage (closets/dressers). Beds all have newer mattresses. Newer carpet throughout. TVs with cable and DVD (TV in living room is a large SmartTV with HD programming including HBO plus Netflix and other streaming options; LCD TV/DVD players in each bedroom). Stereo with Radio and accomodates CDs, bluetooth and iPod. Unit washer/driver. Iron and board. Off-street (driveway) parking for ONE car. The garage can be available for 2nd small car at an additional ($100) charge. 6 adults maximum, no smoking indoors (smoking allowed on the decks), pets are not allowed. There are 3 bedrooms and 3 baths. On the ground floor, we have a very private terrace bedroom with newly remodelled bath en-suite. The middle bedroom has a loft and deck with view of the monument and harbor. The mid- bathroom, accessable via the hallway, is a modern remodel and has a glass sink and a shower with body jets. The top floor bedroom has a deck with views of the ocean and dunes. It also has a bathroom en-suite with dual sinks, a 2 person shower with handheld and rainfall heads, and a spa tub. This is not a PTown "cozy cottage!" This is a spacious, 2200 square foot, 3 level townhouse. Guests will never feel cramped in this well appointed, premium rental. You can call George or Gary at (415) 621-3188. Please note: you're calling California. So call only after 7:00AM Pacific Time. West End - on Bayberry Avenue, near West Vine and Bradford Streets. This is a short walk from everywhere! 5 minutes to Mussel Beach Gym. Walk to the Boatslip in 10 minutes, Spiritus Pizza in 12 minutes. Get to Town Hall in 15 minutes, the East End gallery area in 20 minutes. And very convenient to bike or drive to Herring Cove beach. Views of the bay and ocean from spacious dining room, large living room, bedrooms and roof deck. Wireless Internet: Comcast Broadband is included and accessed via password.